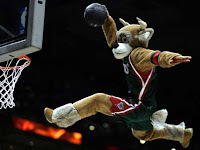 Milwaukee Bucks tickets are available for the entire Bucks season! The Milwaukee Bucks kick off their season at the Bradley Center tomorrow with a preseason game vs. the Minnesota Timberwolves. This should be an exciting season for the Milwaukee Bucks as they are starting the season with a full roster. Bucks center Andrew Bogut has had ample time to rehabilitate his elbow injury and he is healthy and ready to play. The Bucks have also acquired former Badgers basketball star Jon Leuer. If the team can stay healthy, I think we can expect an exciting playoffs run starring the Milwaukee Bucks. Don't miss your opportunity to cheer on the Milwaukee Bucks!